A wild horse advocacy group has been granted status in a case in which two Nevada organisations are suing federal authorities over what they say is an overpopulation of the animals in the state. The nonprofit group Wild Horse Education has been granted status to defend wild horses and burros in the case brought by the Nevada Association of Counties and the Nevada Farm Bureau Federation against the US Department of the Interior and the Bureau of Land Management. It was filed in the Federal District Court of Nevada. The plaintiffs want federal authorities to comply with the requirements of the Wild Free-Roaming Wild Horse and Burro Act of 1971. Nevada is home to the largest population of wild horses and burros in the United States, with more than 80 percent of its public lands under federal management. The two groups say that, under the act, it is the responsibility of the federal agencies that manage public land in Nevada to maintain the balance of species and uses on public lands. To that end, the bureau established appropriate management levels (AMLs) for wild horse and burro populations and is tasked with counting animals and maintaining population levels with the aim of maintaining a thriving ecological balance on the range. The groups say that wild horse and burro populations have far exceeded AMLs for some time, and management practices have not kept pace with population growth. The plaintiffs seek immediate gathers to reduce herd numbers and an end to the long-term warehousing of animals removed from public lands in the state. It instead wants the animals to be auctioned, sold, or otherwise properly disposed of without delay, in accordance with the 1971 act. It also wants federal authorities to cease interfering with Nevada water rights owned by third parties by preventing their owner’s access to and use of water and to cease favoring horses and burros, particularly excess animals, over other users of the lands, including wildlife. 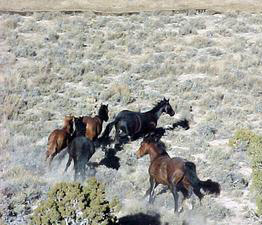 Wild Horse Education announced late last week it had been granted status in the case. Its president and founder, Laura Leigh, said: “We have to try all that we can to defend wild horses against this suit. “BLM’s lack of proactive action to correct flaws made in historic wild horse management has created a situation where our ‘living symbol of the pioneer spirit’ is once again the target of private profiteers. In 2012 the bureau created drought action plans to deal with issues that were arising on the range. A handful of livestock permittees faced restrictions where the length of time or numbers of animals they could graze on public lands were limited. These restrictions created a domino effect of outrage among Nevada livestock producers, counties and state Department of Agriculture, Leigh said. Thank you to Horsetalk for covering this incredibly important suit. And thank God the court realized that Laura Leigh is the correct person to represent our wild mustangs and burros. It is time the livestock growers realize that American taxpayers are tired of subsidizing their private, profit-making business at the loss of our mustangs and burros losing their rightful home on public lands. The cruel roundups and the stockpiling of our horses and burros in long term holding needs to stop. Laura is right. Restricting livestock on public grazing land is vital to the health of that land and to the horses and burros who rightfully call it home. To continue to blame our mustangs and burros is wrong.